Herzog as manager of the St. Louis Cardinals. With his extensive background in player development, Herzog also was a general manager with both the Cardinals (1980–82) and the California Angels. He succeeded Jack Krol as manager of the Redbirds in 1980, managed for 73 games, then moved into the club's front office as GM on August 26, turning the team over to Red Schoendienst. During the offseason, Herzog reclaimed the manager job, then held both the GM and field manager posts with St. Louis for almost two full seasons, during which he acquired or promoted many players who would star on the Cards' three World Series teams of the 1980s. 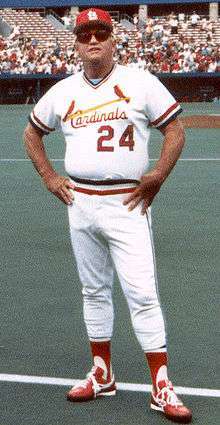 Herzog's final season with the Cardinals, and in his managerial career, was the 1990 season. He finished with a record of 784 wins and 693 losses during his second stint as Cardinals manager. Overall, his Cardinals record is 822 wins and 728 losses. His career managerial record is 1,281 wins and 1,125 losses. After leaving the Cardinals in 1990, Herzog then held various front office and consulting posts with the Angels, including a brief stint (1993–94) as general manager. Herzog and Jim Leyland were leading candidates to become manager of the Boston Red Sox following the 1996 season. Both rejected offers from the Red Sox, so the team hired Jimy Williams instead. Herzog was elected to the Baseball Hall of Fame by the Veterans' Committee on December 7, 2009, receiving 14 of a possible 16 votes. 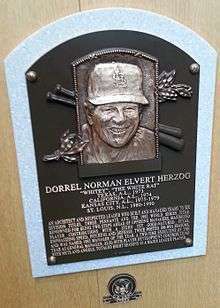 Herzog's induction into the Hall of Fame was on July 25, 2010. In addition, the Cardinals retired the number '24', which he wore during his managerial tenure with the club, in his honor on July 31, following his induction. Rick Ankiel was the last Cardinal to wear number 24. His younger brother, Codell ("Butz") died on Feb. 20, 2010, at 76. He made out Whitey's first lineup with the Cardinals in 1980. His grandson John Urick was a minor league first baseman and outfielder from 2003 until 2010 who played for managers and former Herzog-era Cardinals Garry Templeton and Hal Lanier. ↑ "Lou Maguolo". Baseball-Reference.com. Retrieved 17 June 2015. ↑ Liebman, Glenn (March 1992). "Here Are Some New Names for Humor Hall of Fame". Baseball Digest: 23. ↑ Peterson, John E. (2003). The Kansas City Athletics: A Baseball History, 1954–1967. McFarland. p. 308. ISBN 0-7864-1610-6. ↑ Launius, Roger D. (2002). Seasons in the Sun. University of Missouri Press. p. 124. ISBN 0-8262-1392-8. ↑ The 1972 Season – Retrosheet. 1 2 3 Rogers, Phil. The Impossible Takes A Little Longer. Dallas, Texas: Taylor Publishing Company, 1990. 1 2 1973 Texas Rangers (schedule, box scores & splits) – Baseball-Reference.com. ↑ O'Hearn, Michael (2007). The Story of the St. Louis Cardinals. The Creative Company. p. 44. ISBN 1-58341-551-3. 1 2 3 4 5 "Whitey Herzog". Baseball Reference. Sports Reference LLC. Retrieved August 8, 2016. ↑ "Another Branch in a Baseball Family". Retrieved 2014-05-11. ↑ "John Urick at baseball-reference.com". Retrieved 2014-05-11.